Ivanka Trump said that her father asked her if she’d be interested in heading the Word Bank but she passed. The first daughter told The Associated Press she told her father she’s "happy with the work" she’s doing when he brought it up. President Donald Trump has given Ivanka and her husband Jared Kushner significant influence in his administration. 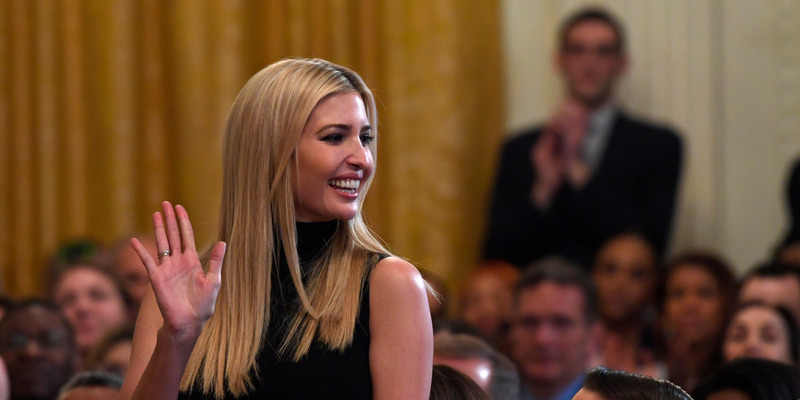 Ivanka Trump on Wednesday said that her father asked her if she’d consider leading the World Bank, but she ultimately passed on the opportunity. The first daughter, who’s an adviser to the president, told The Associated Press she told her father she’s "happy with the work" she’s doing when he raised the "question" of her leading the global financial institution. President Donald Trump has given Ivanka significant influence in his administration, and though she apparently wasn’t interested in throwing her hat in the ring to be the next World Bank leader, the first daughter did play a role in the selection process for its new chief — David Malpass. There have been multiple reports Trump considered Ivanka for not only the head of the World Bank but also as the US ambassador to the UN. In a recent interview with The Atlantic, the president referred to his daughter as a "natural diplomat," adding she "would’ve been great at the United Nations." When asked why he didn’t nominate her, Trump said,"If I did, they’d say nepotism, when it would’ve had nothing to do with nepotism. But she would’ve been incredible." "I even thought of Ivanka for the World Bank" Trump added. "She would’ve been great at that because she’s very good with numbers." When asked if she’d had discussions with her father about appointing her to other roles, Ivanka told The Associated Press she’d "keep that between" them. Some have also speculated that Ivanka might run for office one day, but she told The Associated Press she doesn’t see that happening. Ivanka’s role in the Trump administration has been a consistent point of controversy and led to accusations of nepotism. Her husband, Jared Kushner, is also a senior adviser in the White House. Trump is not the first president in US history to bring members of his family into key White House positions. President John F. Kennedy in 1961 nominated his brother Robert Kennedy to be attorney general, for example. At the time, The Nation magazine slammed the move as "the greatest example of nepotism this land has ever seen." According to an INSIDER poll from March, a majority of Americans (67%) say they have no idea what Ivanka and Kushner do in the White House.